In my last post I started explaining how one can write a so called forward compat layer for a custom application. In the blog post I’ll present the first available bits of such a layer provided as part of the e4-Tooling effort. The idea of the forward compat layer is that you use the e4-Programming Model and write pure e4 POJOs which can be hosted inside an 3.x/4.0 workbench. Let’s at first look at the big picture how an e4-Application and 4.0 Workbench look like. 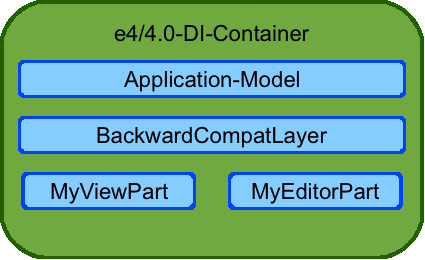 As the picture shows, the idea in the forward compat layer is to setup an DI-Container in a running 3.x Workbench and reusing the DI-Container provided in a 4.0-SDK Workbench. You should notice that the only “framework”-code we are depdending on is a bundle which defines the annotation we are using. Typically the components are kept in an extra bundle which has only dependencies on DI-Stuff. 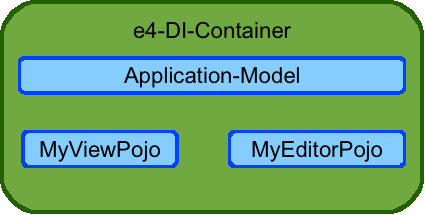 If we want to integrate ourselves into a 3.x/4.0 SDK we somehow need to register our POJO in the DI-Container which is done in an e4-World by the ApplicationModel. The 3.x/4.0 integration is typically kept in a bundle which depends on the bundle with the component(s) and the standard set of 3.x plugins like (org.eclipse.ui, …). This entry was posted in e4, Uncategorized. Bookmark the permalink.